Kdan Mobile Software Ltd. (Kdan Mobile) released a major update for its PDF Reader on Windows from its award-winning PDF series, featuring the addition of Windows Ink and Creativity 365, and an improved user interface. This release signifies the developer’s ongoing effort to optimize all its flagship applications across major operating systems. Kdan Mobile Software Ltd. (Kdan Mobile), the Taiwan-based mobile software developer is set to release a major update for its PDF Reader on Windows from its award-winning PDF series. This release signifies the developer’s ongoing effort to optimize all its flagship applications across major operating systems. A few main features released in this update include the addition of Windows Ink and Creativity 365, and an improved user interface (UI). The PDF document solution application, PDF Reader for Windows offers fundamental tools for users to view, make annotations and manages PDF files with a straightforward, user-friendly UI. PDF Reader is Kdan Mobile’s signature application that founded the Company. With the adaption of the Universal Windows Platform framework in early 2017, users can now conveniently access PDF Reader from any Windows devices that includes phones, tablets, and desktops. The latest update brings users new improvements that propel productivity and accuracy when editing a PDF. 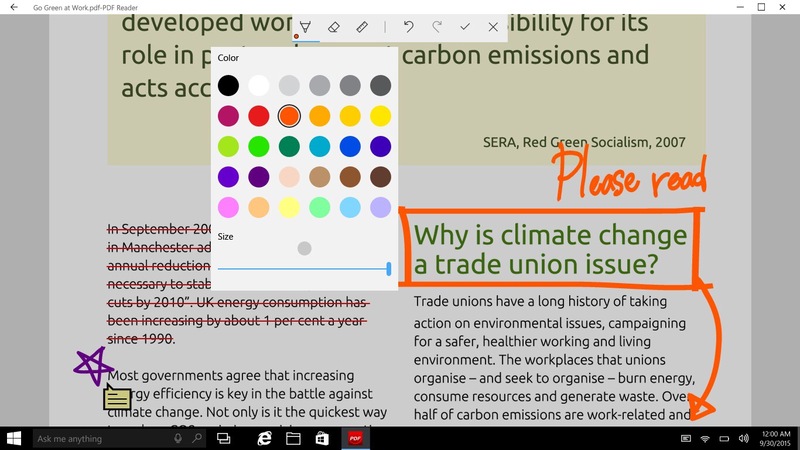 PDF Reader fully supports Windows Ink, the solution to interact with Windows touch screen devices and for digital writing. The newly added Windows Ink Workspace includes a digital ruler for drawing or writing a neat line, pens with an extensive color palette for handwritten annotations and an eraser. The Company claims that its latest iteration of PDF Reader takes full advantage of all the features that Windows Ink Workspace offers. "Our users have always been at the heart of design at Kdan Mobile. The latest version of PDF Reader is designed to suit their needs, especially in an era where we have multiple devices. We have shaped the user interface and user experience to accommodate the differences between devices and operating systems. We have also enhanced our platforms and services for users to collaborate and accomplish greater efficiency", commented Chris Su, Vice President of Innovation and Design at Kdan Mobile. “The added Windows Ink Workspace is also very favorable particularly for users fond of stylus. We aim to further improve our offerings on Windows devices,” he added. Fully supported by the Kdan Cloud, PDF Reader users can upload files on the app or website for storage or file sharing. Kdan Cloud access is not limited to just Windows devices and PCs, users are also able to connect to and sync files across devices running on other major platforms including iOS and Android. Kdan Creative App series is now boasted with support from over 100 million users worldwide. Kdan Mobile now offers a subscription service called Creativity 365. Creativity 365 grants users extended access to the whole Creative App series, including PDF Reader, fulfilling the demands for document management, information organization, creative idea generation, and multimedia editing. Creativity 365 streamlines content creation workflow across different devices, providing complete mobility and flexibility, and offers 1TB Kdan Cloud storage. PDF Reader is free to download in Windows Store and also available on Android, iOS and Mac. When subscribed to the annual plan for Creativity 365, subscribers will receive a complimentary Adonit Dash 2 stylus until July 31, 2017.